Protecting the prime minister while still allowing him to interact with the public is a delicate balancing act, security experts said Tuesday, a day after two protesters got within arm's-length of Stephen Harper. 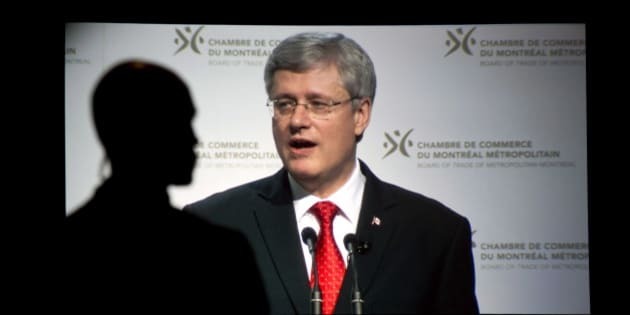 Two climate-change activists slipped past layers of security at an upscale Vancouver hotel to hold up signs behind Harper while he was on stage at a closed event on Monday. The pair — dressed in black to blend in with catering staff — were quickly removed and no criminal charges were laid, but the incident is being reviewed by the RCMP to see what more needs to be done to ensure the prime minister's safety. While there's no doubt the security breach was a serious one, a former RCMP officer who was with the force for 20 years said it's impossible to prevent such incidents from happening entirely. "There's always going to be breaches like that, but it's all about democracy," said Chris Mathers. "We don't limit people's movements in a democracy, we don't ask people for their papers at every corner and leaders of democratic nations understand that they're putting themselves in harm's way just by taking office, because you can't predict what's going to happen." As an example of that unpredictability, Mathers pointed to a recent memorial in South Africa to honour Nelson Mandela where a phoney sign-language interpreter who allegedly has a criminal background stood just a few steps away from U.S. President Barack Obama. In an earlier incident, a couple from Virginia got past security checkpoints at the Whitehouse in 2009 and was able to shake hands with Obama while crashing a state dinner as uninvited guests. "The police are limited in what they're allowed to do and how they're allowed to control people's movements," he said. "It's a very, very difficult thing." The risk associated with the Vancouver incident, however, was nonetheless very real. "If they were terrorists it could have been a terrible situation, if it was a suicide bomber it could have been a terrible situation," Mathers said of the silent protesters. "But I don't think it should be blown too far out of proportion because the guys protecting the prime minister are pretty sharp." The incident would have no doubt triggered much discussion within the RCMP, said Larry Busch, a former Mountie who was tasked with VIP security operations in Ontario in the past. "There would be a very thorough investigation done by both the RCMP in Vancouver and the senior personnel at the prime minister's protective detail in Ottawa," he said. Busch suggested that lessons learned might include having all staff at a venue being attended by the prime minister vetted by police and being issued badges. But even those measures could not entirely prevent someone from acting out. "A single individual can still stand out in a security situation," he said. Busch noted, however, that prime minister's protective detail is constantly scanning crowds to assess body language, demeanour and facial expressions which might hint at potential problems. "I think what the Canadian public does not see is the many, many times that the RCMP security levels do work," he said. "The body guards do intercept people and turn them away."